Columbus Museum of Art is proud to present A Dangerous Woman: Subversion and Surrealism in the Art of Honoré Sharrer, the first major assessment of the artist since mid-century. Organized by CMA in partnership with the Pennsylvania Academy of the Fine Arts, the exhibition provides a comprehensive examination of Sharrer’s place in American art and reveals the full scope of her significant achievements. A Dangerous Woman includes some 45 paintings, plus associated sketches, prints, photographs, and ephemera from the artist’s extensive archive. Honoré Sharrer (1920 – 2009) was a major art figure in the years surrounding World War II. She was, in many ways, a rebel, whose paintings marked covert but unflinching resistance to the oppressive political and social conventions of the Cold War era. Her gender, commitment to leftist ideals, and use of figurative surrealism put her at odds with the dominant political and artistic climate of the 1950s. Sharrer found that she was progressively marginalized—she and her husband essentially black-listed—by the suppression of political difference carried out by forces like Senator Joseph McCarthy and the House Un-American Activities Committee. Simultaneously, Abstract Expressionism, epitomized by artists such as Jackson Pollock and Willem De Kooning, dominated the American art world. Sharrer, like other female artists, struggled to find equal billing given the masculine aesthetics of this movement. The exhibition is curated by M. Melissa Wolfe, Curator of American Art at Saint Louis Art Museum, and former CMA Curator of American Art and Robert Cozzolino, Patrick and Aimee Butler Curator of Paintings at Minneapolis Institute of Art. An exhibition catalogue is available in the Museum Store. Photography encouraged: Share your photos with us: #myCMA @columbusmuseum. 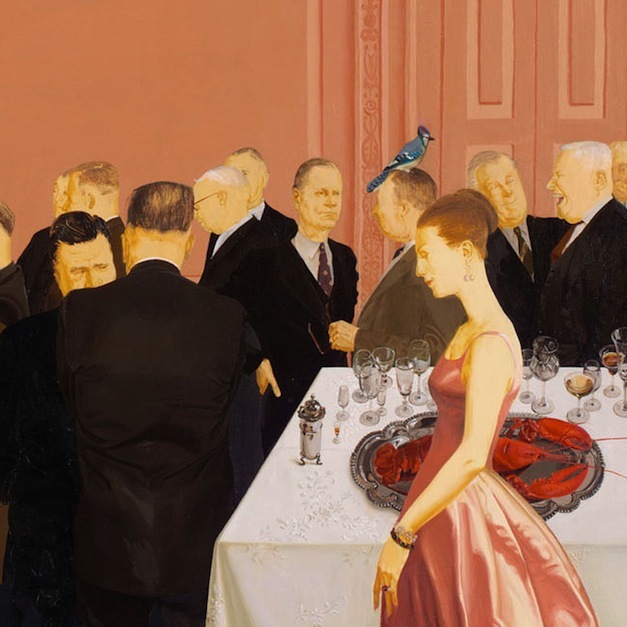 Image: Honoré Sharrer, Reception (detail), 1958, oil on canvas, 22 1/2 x 30 inches, Collection of Adam Zagorin and the late Perez Zagorin. The catalogue for this exhibition made possible, in part, by Furthermore: a program of the J. M. Kaplan Fund. If you are interested in supporting exhibitions at the Museum, please contact Lucy Ackley lucy.ackley@cmaohio.org, 614.629.0351.